Move with local and long-distance moving companies you can trust to do a job well done. For over 40 years, Slater Transfer & Storage has been one of those respected Utah moving companies with a reputation of integrity and excellence in our work. We strive continually to show each of our customers how much they matter to us. From coordinating office moves down to the last detail, to treating valuable family heirlooms with the greatest care in a residential move, we hope to prove to you what makes us stand apart from the rest. Each of our local and long-distance movers receive extensive background checks and training before taking on their first move. They can be found at the main Utah office for our licensed and insured moving company located in St. George. We take great care to ensure that your move goes smoothly, with little to no hassles that are common with the moving process. We simplify and streamline packing and moving so that you get on the road sooner to your new destination. Learn more about the Slater Transfer & Storage experience by contacting us and request a free moving quote. Ask about pricing for packing boxes and materials, available storage space and any of our moving services for which you are in need. Your own project manager will give you a no-obligation estimate personalized for your needs and can help you start planning for this Utah, interstate or international move, without the stress. Whether you’re staying in Utah, leaving the state or moving in for the first time, let Slater Transfer & Storage give you a hand. Our experienced team has the resources for moves large and small, both for residential as well as commercial moves. We will be considerate of your time, budget and situation to pack up and move out effectively. Beyond our dedication to great customer service and professionalism, we also offer competitive pricing on all our moving services. That includes our local moving services around the St. George area and throughout the state of Utah. For homes and businesses moving greater distances across states or around the world, our business is a long-distance moving company based out of Utah. 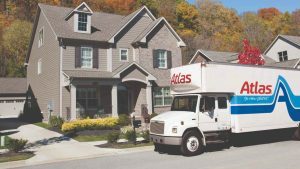 We are connected to Atlas Van Lines’ large network of trusted national and international movers so you never have to worry about this new relocation. Because no move is the same, we customize our estimates and pricing based on the number of items and the distance. Let us tailor a moving quote for your upcoming move! Or get in touch with us about our storage facilities conveniently located in St. George, UT where you can keep belongings safe while in between homes or offices. Contact us today to begin making your move simpler and to transport belongings safely. Give us a call at (435) 634-0536, or fill out a quote request at the bottom of this page. One of our full-service movers will respond to schedule your free, on-site quote as soon as possible. Large fleet of moving trucks and trained drivers—no job is too big! We look forward to speaking with you soon! See why hundreds of customers continue to use Slater Transfer & Storage whenever they need full-service movers in Utah. Contact our long-distance movers when you’re moving to a new state, cross-country or to a foreign country altogether. Our Utah moving company makes it simple to get you from here to there. Even when here to there means moving to a new home or commercial building within the same city, our Utah movers are here to help. They provide the same great service, no matter the move. Need to keep extra belongings or business inventory in a safe and secure location? Use our indoor storage facilities in St. George with state-of-the-art security and specialized space for boats, RVs and more. Commercial and office movers at Slater Transfer & Storage will transport your business’s belongings safely and in an efficient manner so your company doesn’t lose precious work time. Request your free quote!